With the newest addition to the MiLi iData storage series, the iData Air, you can wireless save and transfer pictures, video and other files to and from your mobile device. With the iData Air, you are in control of your data. When. Where. What and How. Simply keep your iData Air securely in your pocket or bag. Allows up to 7 devices to access at the same time. Share content with multiple iOS or Android devices at once. Think about using iData Air in your next team meeting, or watch movie together with your friends in next trip. Offers 32GB and 64GB as external storage of your mobile devices, choose the suitable capacity when you need it. 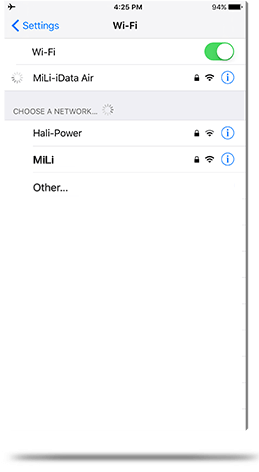 Trust the stability and speed of MiLi technology to ensure your data and files are safe and secure with Wi-Fi pass code when you needed. Never miss any Internet notices while using iData Air. Transmit data between mobiles and PC easily and quickly. Use the Smart App to manage your data - from iDevice to iData Air to Android phone. It’s your choice.